Hammocks have seen a boom in recreational popularity in recent years. Walk through any outdoor retailer and you’ll undoubtedly see several models on display, complete with accessories like rain flies and mosquito nets. As this popularity skyrockets, hammock camping has become the preferred option for many outdoorsmen. It takes more than just a hammock to do hammock camping right, though, and today we have some tips to keep you comfortable and safe when sleeping suspended between two trees. Once you know how to set up your hammock and sleep in it properly, you’re going to sleep better than you ever have on a camping trip. You might get a better night’s sleep than you do at home. You’ll fall asleep with a smile on your face and you’ll wake up happy and refreshed, ready to take on another stretch of trail. Many outdoorsmen suffer with a sore back or neck all day because they slept on a rock or root the night before. With a hammock, you don’t have to care what the ground looks like underneath you. You can camp on a hill, over rocks, roots, stumps, snow, lava—well, maybe not lava—but the point is you have the same level of comfort night after night, no matter what. 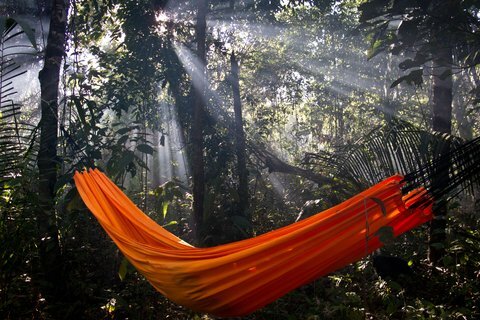 The first night you fall asleep and wake up in a hammock you’ll realize just how fresh the night air can be when there’s nothing between you and it. In a tent, you lose the air flow, you lose the stars, you can’t stand up to do anything and you can’t easily see what’s around you. Furthermore, when you wake up in your hammock, there’s not that stuffy, sauna-like effect that tents can often have. There are some who think that opting for a hammock means sacrificing the comforts of a tent. However, many modern hammocks offer the same features as tents, including a mosquito net, rain fly and even a gear loft for your belongings. Models like the Warbonnet Blackbird or the Hennessy Expedition Asym are solid options.